A more detailed description of the diploma program can be found here. Apart from that: I loved chai, parantha, and the fun we had. KIBI and Mewar University have just signed a Memorandum of Understanding (MoU) about their collaboration. Beginning from the academic year 2014/15, KIBI's existing diploma course will therefore be transformed into an internationally recognized degree program in Buddhist Studies (Bachelor or Arts in Buddhist Studies). Throughout the year, KIBI offers additional public teachings and short-term courses on subjects such as meditation, Buddhist philosophy, and languages. Some of these courses are overseen directly by H.H. 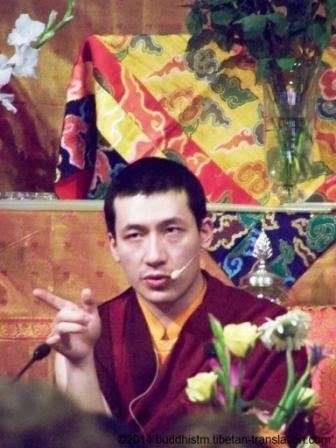 the 17th Gyalwa Karmapa and/or other high-ranking spiritual masters. “Yes indeed! KIBI is an incredible place! One year, a friend of mine who isn’t a Buddhist came to visit me during the 5-day teachings by Karmapa, where we had also additional lectures with Khenpo Tsering and Professor Sempa Dorje. Since H.H. Gyalwa Karmapa spends a large part of the year in Delhi, one can feel his presence at the institute in many ways. For instance, he often engages students directly in Question-and-Answer sessions. 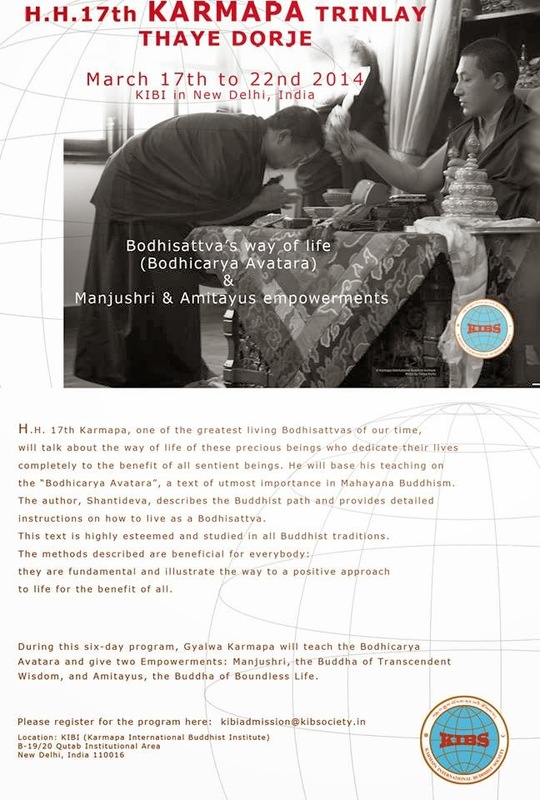 It is a wonderful opportunity to learn and practice Buddhism in such an environment. 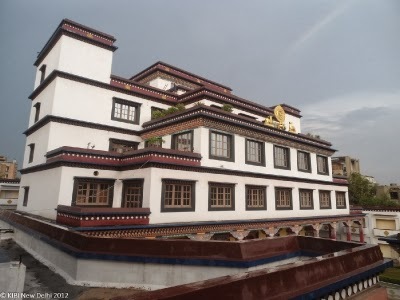 The four-story main building houses a large shrine hall, an auditorium, lecture halls, a well-equipped Buddhist library, offices for the administration and a lounge. Breakfast and two meals a day are offered to teachers and students in the dining hall at the basement. KIBI offers boarding for its students. Surrounding the main building in a semicircle are further offices as well as the housing tracts with rooms for teachers, guest lecturers, foreign students and visitors (attached or common bathroom). There is a high chance that your teachers and co-students will feel like family after living and studying so closely with them for a long period of time. Can one recommend studying at KIBI? Personally, I can definitely recommend it, and almost everyone who studied there with me with whom I talked, considers the time at KIBI as something very special. You not only learn many meaningful things, but the experience is very transformative in many ways. It will certainly change you for the better. Studying in India is, of course, challenging at times. If you are coming from the West, you are entering a completely different cultural area. If you are open-minded, you will have a very enriching experience. It may also help you to question and view your own culture and life in a completely different way. “Being in KIBI was transformative for me. I remember being disappointed realizing that KIBI was located so near the airport when I arrived there. I was kind of imagining some place like Potala, but it was night and in the morning I had a first glimpse of KIBI. I still remember how surreal it felt. It's just a place that grows on you. For me, I felt like the luckiest person in the world, being able to receive teachings from Khenpo Rinpoche. Coming from Asia, it has been uncommon until recently to get Dharma teachings, not to mention profound ones. Buddhism was mostly about rituals and blind faith for many of us back then. 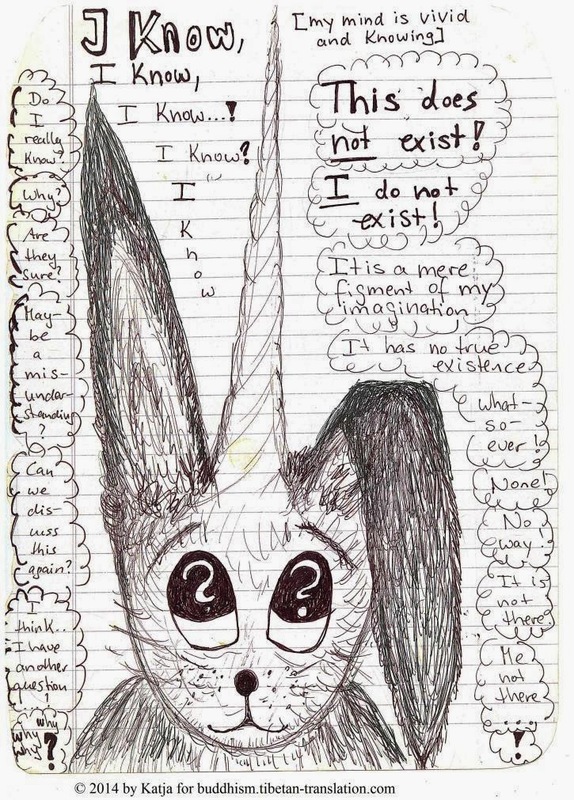 'Emptiness is not nothingness' were the first words I remember hearing in class. They went off like fireworks in my mind. - and at the same time purifying lots of negative karma, emotionally and physically, during my years in KIBI.